The Little Falls Depot follows the prototypical layout of small depots with a long narrow single-story main block and a two-story center section that allows for an individualistic design as the local image of the railroad. Here, the style is Old English, an unusual application for depots of the era. The large transverse gable features half-timbering with heavy bargeboards. The open porch at the end of the building is supported by stone columns and a Tudor gable beam and column truss, an open version of half-timbering that became common to the Tudor and Craftsman styles. 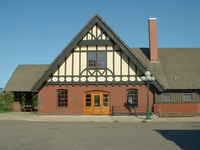 The color scheme for the depot included black half-timbering, red soffits and window sashes, brown siding, green trim, and unpainted stucco. Much of the original detailing of the depot survives, and the building is currently used as a museum. The image is thought to be from an original rendering by Holyoke. It has been computer-enhanced. 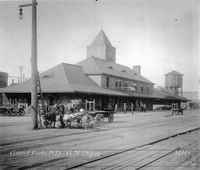 The Little Falls Depot was one of four Gilbert designed in 1899 before his association with the Northern Pacific Railway ended. Since 1991, the building has been the home of the Little Falls Chamber of Commerce.